So the winners have finally be drawn! Congratulations to all Five people that won, including the four people who won the four Gift Certificates from Box O' Rice, and the Grand Prize winner that snagged the Gift Certificates worth P5,000 from Cathy Valencia Skin and Body Center. Watch this Video to see the draw for yourself! Once again, thank you to everyone who participated, and a special shout out to Cris Villarosa of Box O' Rice for the consolation prizes, and Jo Chanco of Voice Of The South for the Grand Prize! 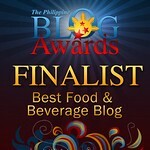 Thank you to www.myfoodtrip.com for their support, as well as everyone who helped spread the word about the Giveaway! Now that I'm done with my first "Giveaway", I can plan the next! Hopefully the next one will be even better! Please remember that this can be availed at Box O' Rice Katipunan Branch! Ms. Golda Ajero has generously decided to give her awarded GC's back for a re-draw! So the new winner in her place is.. Aiza Rachelle Albaracin! I'll be emailing you within the next two days to coordinate the distribution of your prizes! Till the next Giveaway!! That was my top hat! the one that i used in the picture of the contest! hehe.. Hinanap pa talaga ni Rina yan sa Divisoria! sir thanks so much! funny i was aiming for the food GCs haha! haha you wanna swap with someone? I just started reading your blog today and you're hilarious! It's great that you have the talent to tell people about your love for food. Keep it up! Thank you so much Anonymous... I have no intention of stopping! Your comments are very much appreciate and it sincerely warms my heart to hear it! BTW, where did you get the giant hat :D ?